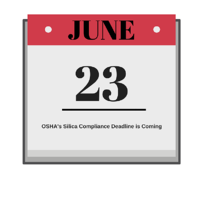 OSHA'S Silica Compliance Deadline Is Coming On June 23. Are you Ready? The hazard of respirable crystalline silica exposure has been known for decades. In 1938, a Department of Labor video featured hazard awareness and preventative measures, but evidence indicates exposed employees are still suffering substantially from silica-related diseases. The time for compliance is coming soon for OSHA’s Silica Safety standard requirements for General Industry and Maritime. Say it with me… June 23. In less than a month, employers will be required to comply with limiting exposure to respirable crystalline silica and taking other necessary steps to protect employees. More information relative to health effects, standard requirements, and available resources will not only begin leading you down the path of effective control, but you will become a better leader focused on eliminating a hazard that exposes 2.3 million employees within the United States. Are you feeling any shortness of breath? Thousands of employees across the United States are affected annually by silica-related occupational diseases. Let’s start with silicosis. Also known as “Grinder’s Asthma,” silicosis is caused by inhaling crystalline silica dust and is marked by inflammation and scarring in the upper lobes of the lungs. The disease typically occurs after 15-20 years of exposure. Symptoms may not be obvious, so a chest x-ray is needed to determine lung damage. There is no cure for silicosis. Exposure also increases the risk of developing lung cancer and chronic obstructive pulmonary disease (COPD). Because such diseases are slow to develop, symptoms such as: shortness of breath, persistent coughing, fatigue, and chest pain also take time to occur. Before we even think about continuing business as usual, let us turn to the enforcer’s expectations. -Assess employee exposures to silica if it may be at or above an action level of 25 µg/m3 (micrograms of silica per cubic meter of air), averaged over an 8-hour day. -Protect workers from respirable crystalline silica exposures above the permissible exposure limit (PEL) of 50 µg/m3, averaged over an 8-hour day. -Limit workers’ access to areas where they could be exposed above the PEL. -Use dust controls to protect workers from silica exposures above the PEL. -Provide respirators to workers when dust controls cannot limit exposures to the PEL. -Use housekeeping methods that do not create airborne dust, if feasible. -Establish and implement a written exposure control plan that identifies tasks that involve exposure and methods used to protect workers. -Offer medical exams – including chest x-rays and lung function tests – every three (3) years for workers exposed at or above the action level for 30 or more days per year. -Train workers on work operations that result in silica exposure and ways to limit exposure. -Keep records of exposure movements, objective data, and medical exams. Before you lie to yourself with “I’m not going to inhale this nonsense,” consider the useful material available to you to ensure effective compliance. Are you worried you won’t be able to breathe it all in? Have no fear… useful resources are here. Our HSE Advisors are monitoring this upcoming deadline very closely and we strive to stay well-informed of all aspects to provide unmatched services to those employers looking out for the safety and health of their employees. The National Institute for Occupational Safety and Health (NIOSH) is another great resource. They have a safety and health topic devoted to silica which provides information and links to related publications and references. OSHA recognizes that most employers want to keep their employees safe and protect them from workplace hazards, so they have setup a crystalline silica rule making page with more information. Everyone has everyone else’s back on this, so what will be your first move? You can’t start the next chapter if you keep re-reading the last one. Our customizable silica exposure control plan is your first step to protecting employees everywhere. It will include, among other things: exposure assessments, engineering controls, housekeeping efforts, PPE recommendations, and training requirements. Mark your calendar and save the date – June 23, 2018. Before it is too late, find out more about how we can help protect your people from the preventable exposure to respirable crystalline silica which leads to horrible disease and inevitable death. Let us breathe easier and control silica dust together.